brokenclay.org/journal > Life with a Disability > Accessibility > Accessible CAPTCHAs? I have two arts-based disability blogs and I was unaware of the problem with captchas. So many people use them to avoid spam comments. How do you avoid this? Can you recommend any sites for guidelines for making an accessible web site? 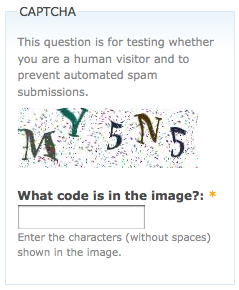 My personal response, before I go googling, is to say don’t use CAPTCHA. Don’t make your legitimate readers and commenters work harder because there are scumbags out there who spam. If your blogging software/mail host/whatever doesn’t provide you with adequate tools to filter spam, find an alternative that will. But I also know that the spam can get unbearable to the point where you wouldn’t even know if you had legitimate comments. So folks, what are the accessible options out there? Me, I just work harder to eliminate the spam. I have an RSS feed set up for my comments, and when a new spammish one pops up, I delete it ASAP. I love my commenters, It’s my heroin you see. If I need to pay attention to them, all the better. You can use audio captchas additionally but to be honest I don’t like captchas at all. I use WordPress and the SpamKarma-Plugin. It works pretty well. And I always check my comments. I’ve seen a lot places use audio captchas, which seems like a nice idea–though I’m not sure how hard it is to implement. In addition to SpamKarma, I’ve heard honeypot does a good job. I think you can also get plugins that catch anything that has more than 2 outgoing links. I’ve CAPTCHAS with the option to play an audio file of the visible code, as a nod to accessibility. However, I haven’t heard any commentary on them – i.e. whether they really help or not. I hate the darn things as well. After getting hit with 50 spam in a single day, I had to add something, but ironically, since I have dyslexia I often fail in trying to comment on my own blog – I think I will try to add one of these alternatives.